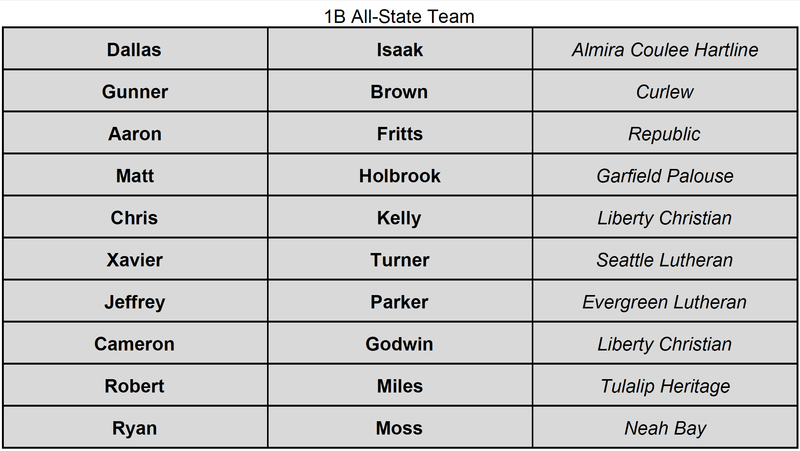 The WIBCA All State Games take place this Saturday at Mountlake Terrace High School. 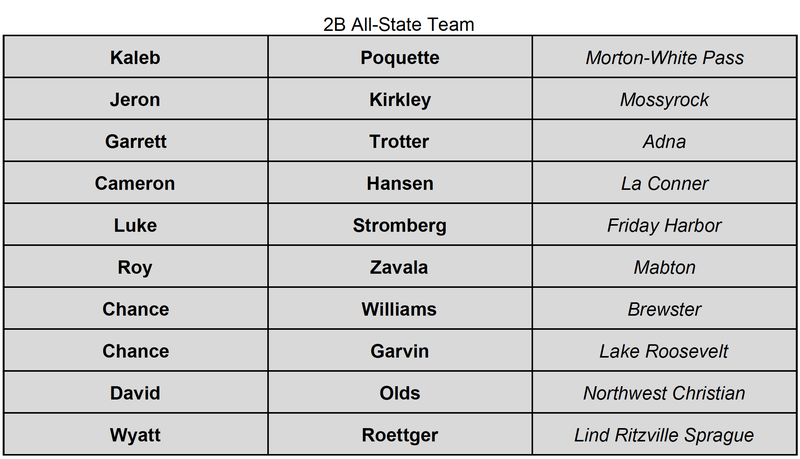 The Washington Interscholastic Basketball Coaches Association have put together its annual Boys All State Games featuring players from all classifications as they wrap-up their high school careers. 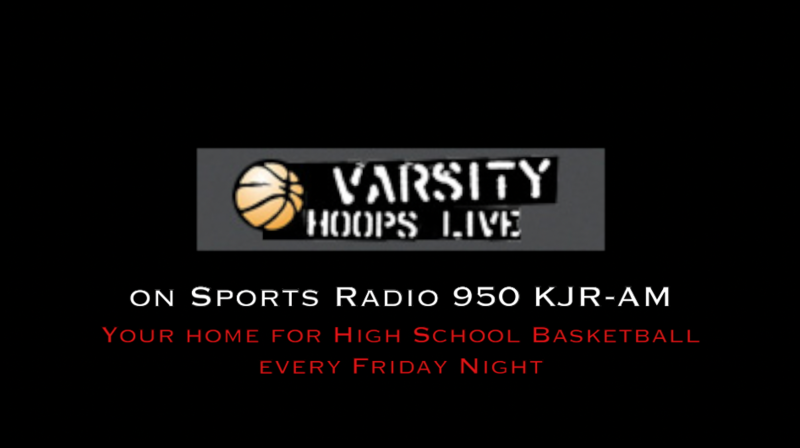 Listen as Steve Willits from Sound Live Sports Network provides all the details about the event including some of the top players from each classification’s team! 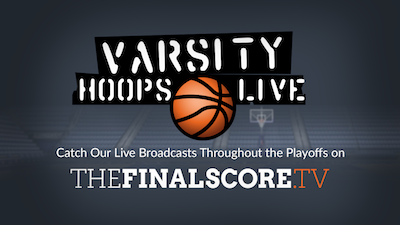 Listen to the 2016 WIBCA All-State Preview by Steve Willits from Sound Live Sports Network by clicking on the play button below! 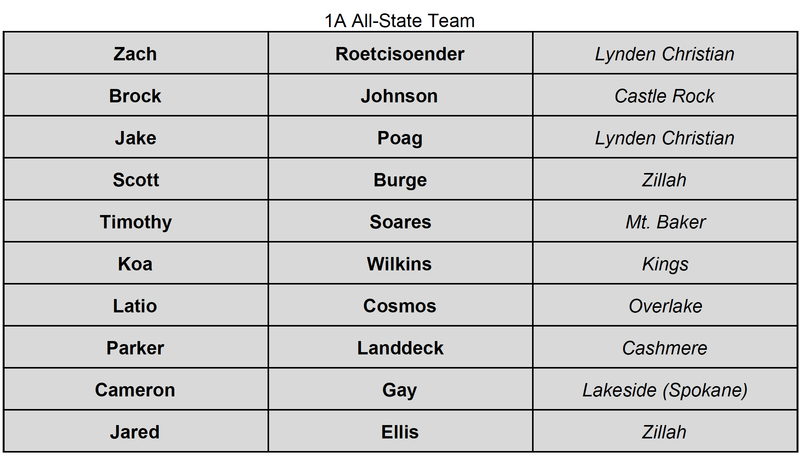 The WIBCA All State Games take place this Saturday at Mountlake Terrace High School. 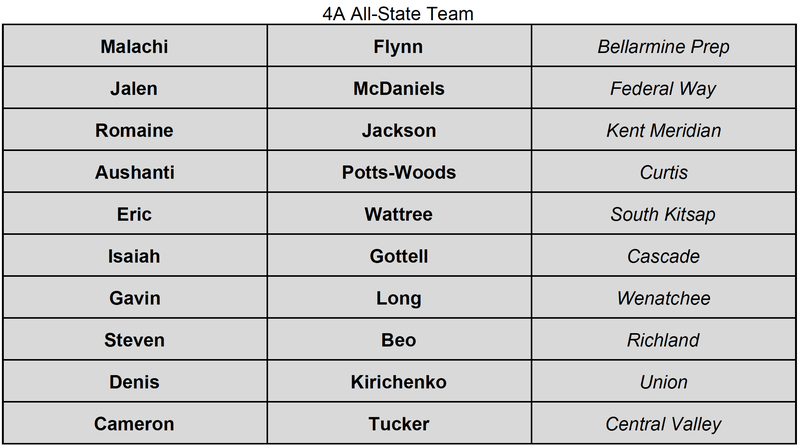 The Washington Interscholastic Basketball Coaches Association have put together its annual Boys All State Games featuring players from all classifications as they wrap-up their high school careers. There is no better place to watch high school basketball in Washington state than the Tacoma Dome for state final action. In a matchup of two SPSL teams, the Kentwood Conquerors were looking to end Federal Way’s 42 game winning streak and bid for two consecutive state titles. Kentwood came out of the gates playing sound basketball, cleaning up the defensive glass and playing excellent defense. They lost their previous two matchups against the Eagles of Federal Way, and they weren’t going to let this game go easily. A 29-25 halftime lead for the Conquerors provided a great boost to their fans for the final 16 minutes of action. Jerome Collins, the head coach for the Eagles, gave his team a defensive focused talk at the half and it showed through the duration of the 3rd quarter. A 29-25 Conqueror lead turned into a 42-35 Eagle lead going into the fourth. The six point quarter for the Conquerors was their lowest of the tournament. On the offensive side, the Eagles were able to get out in transition and finish a number of uncontested layups. With a seven point lead going into the fourth and all the momentum, the game was seemingly in the Eagles hands for another title. But Kentwood would not give up so easily. The lead was trimmed to as little as 3 early in the fourth, with the Conquerors battling possession by possession. But in the end, the combination of Ferron Flavors, Christian Jones, and Jalen McDaniels proved too tough for the Conquerors to surmount. 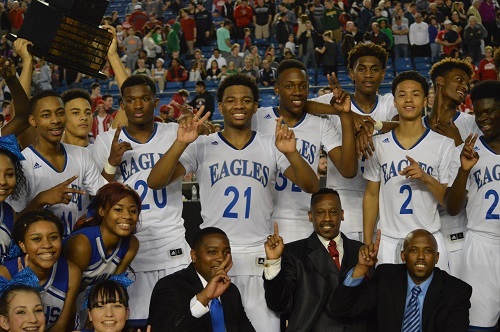 Congratulations to the Federal Way Eagles for their 43rd consecutive win and back to back state titles! Federal Way 66, Kentwood 54. In their third matchup of the year, the O’Dea Fighting Irish faced off against the Rainier Beach Vikings for the 3A basketball coveted state championship. 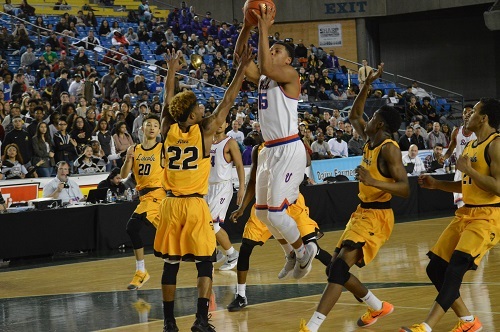 Rainier Beach was fresh off a win over the #1 ranked Garfield Bulldogs, another Metro league team, and looking towards a dominating performance in the final. Beach started the game on a frantic pace, seemingly knocking down every shot and consuming O’Dea with their defensive pressure. At halftime, Nkeil Nelson for the Vikings had as many points as the entire O’Dea team, 21 a piece. The Vikings took a 43-21 lead into halftime, seemingly ending the game at intermission. O’Dea didn’t do much to trim the lead in the third quarter. Rainier Beach definitely slowed their pace down, shortening the game in favor of longer possessions. The 22 point halftime lead progressed to 25 for the Vikings, with a 57-32 advantage. The expectations entering this contest leaned towards a close matchup. These two split their regular season meetings, surprising based on the outcome of this contest. 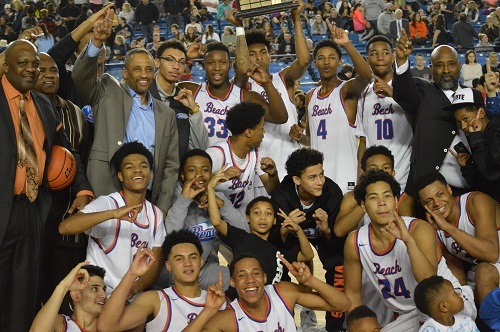 Rainier Beach took the victory with ease, 70-49, amassing their 4th title in the last 5 years. A lot of sportsmanship was shown from both sides. 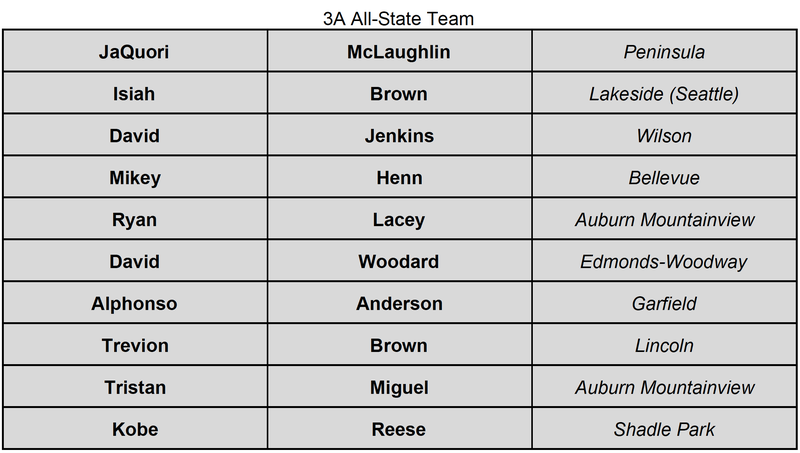 Congratulations to Rainier Beach! Rainier Beach 70, O’Dea 49. Entering the 2015-16 season, Coach Leah Krautter knew she had a talented squad, but didn’t know how all the pieces would fit together. After the first game of the season, she was encouraged this team was special. After topping Lynnwood on Friday which may have been Bellevue’s toughest test to keep their unbeaten record intact, they entered championship Saturday with the expectation to close the deal and lift the trophy. 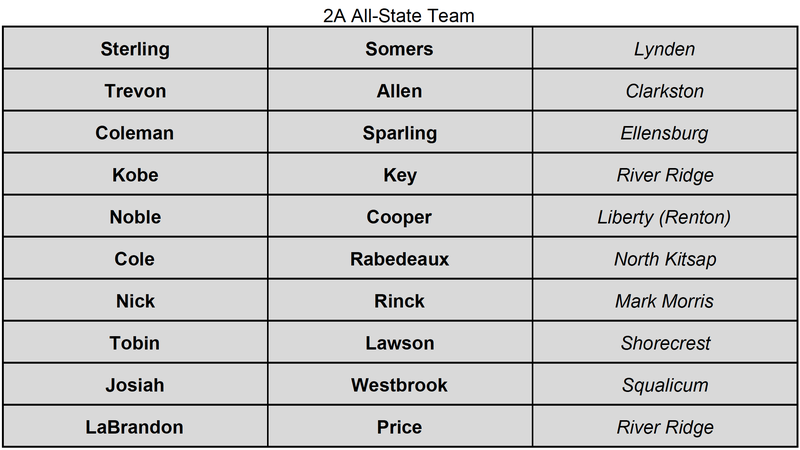 To do so, they needed to get past Arlington who is no stranger to deep tournament runs. Much like the game played prior to this one between Rainier Beach and O’Dea, Bellevue outmatched Arlington from the early stages of the game and it carried throughout. By halftime, they built a double-digit lead which put the Eagles on the ropes. Gracie Castandea and Serafina Balderas needed to spark the Eagles to climb back into the game after solid contributions in the first two quarters. The stifling Bellevue defense held Arlington to four points in the pivotal third quarter leading to 19% from the field in the second half. Meanwhile, the Wolverines kept the pedal down as Shelby Cansler and Quinessa Caylao-Do broke the game open as the duo combined for 41 points. The victory against the Royals on day two proved to be the quasi championship game as the vast majority of the second half was simply a wait for the inevitable. 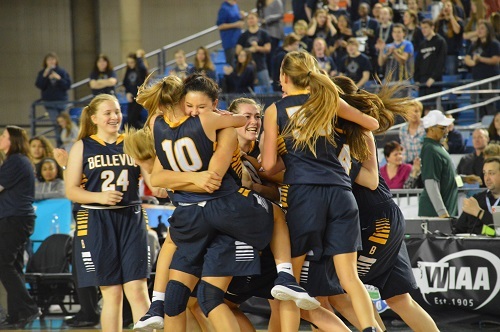 Congratulations to Bellevue on going wire to wire from the opening tip of the season. 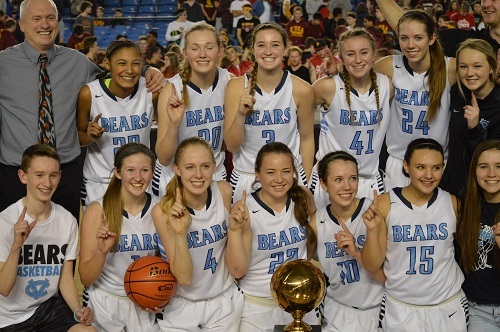 In a battle of two teams on incredible winning streaks, the Central Valley Bears took on the Snohomish Panthers for the 4A girls state championship. The Bears came into this game a perfect 28-0, and the Panthers, after losing their first three games, were riding a 23 game winning streak into this finals matchup. Snohomish started the game in an interesting defensive matchup, with their tallest starter, Madeline Smith, guarding the Central Valley PG Mady Simmelink. Smith rarely left the key on the defensive side, giving Simmelink wide open looks. She capitalized with 5 first quarter points and Central Valley took a 12-9 lead into the second quarter. The undefeated Bears began to pull away in the second, extending their lead to 11 and picking up their defensive intensity. But Snohomish would not quit; they are older and bigger than the Bears and they used their size to convert a few layups down the stretch before half. Central Valley took a 5 point lead into the locker room. Madeline Smith for the Panthers began to take over after the half. She went on a personal 10-0 run, and halfway through the quarter she had 25 of her teams 30 points. The underdog Panthers tied the game later in the frame, looking to take their first lead since early in the first. 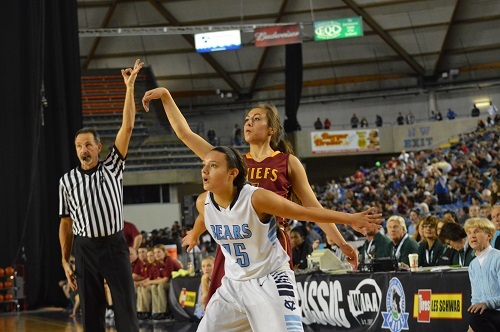 But Lexie Hull responded for Central Valley, adding in a couple of short layups for her team leading 13 points. Even with Madeline Smith’s dominate performance, the lead remained 5 for the Bears, 35-30 entering the final quarter. Snohomish began the 4th on a 5-0 run, tying the game again. But every time Snohomish tied it up, Central Valley would respond. 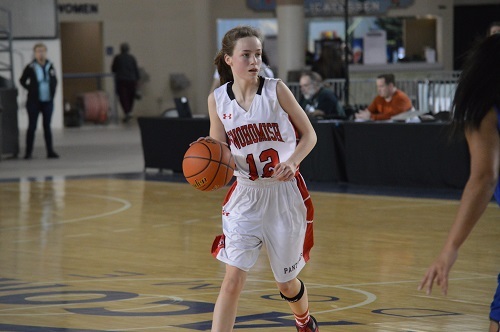 This time it was Lacey Hull, Lexie’s twin, who knocked down a momentum shifting three pointer. The Bears never looked back. They completed their perfect 29-0 season with a well deserved 57-48 championship win! 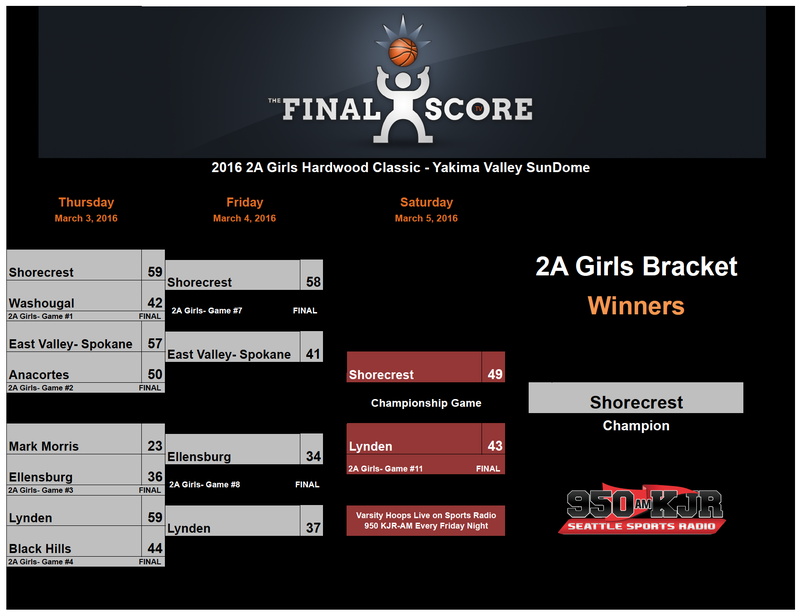 Central Valley 57, Snohomish 48. Following their thrilling overtime victory against Lewis & Clark on Thursday, Snohomish earned a meeting in the semis with Bothell who put Kentlake away with relative ease in the opening round. The game jumped out to a sluggish start with only a 14-10 halftime score as both teams struggled to find a rhythm and moreover the bottom of the cylinder. Snohomish broke the game open in the third quarter by going on a 15-5 run which set up a race to the final whistle. Madison Pollock and Madeline Smith led the way with 17 points each. The Cougars who received 19 from Taya Corosdale were unable to make a late charge and the Panthers move on to the 4A championship! A battle of teams hailing from Seattle and Tacoma placed Rainier Beach and Lincoln in a Thursday lunchtime bout. The Abes enjoyed the home court advantage from the opening tip by taking a two point lead into the second frame. The Abes converted on a number of possessions in which they attacked the rim. However, the suffocating Rainier Beach defense started to roll as the half wore on and posted 24 points in the second frame alone putting the Vikings up by a dozen at the break. The contributions of Lincoln’s Brandon Cotton and Trevion Brown who netted 15 and 14 respectively proved not enough as leading scorer Sam Cunliffe who finished with 19 was joined by four other double figure scorers (Keith Smith, Marquis Gurski, Tijon Rodde, N’Kiel Nelson) before the final whistle. 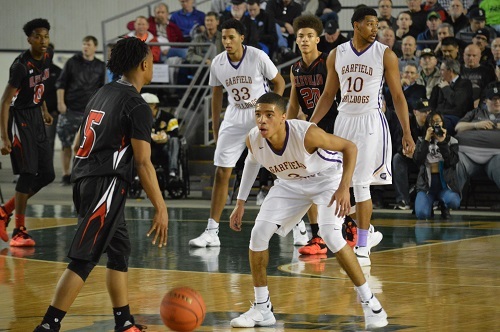 A rematch of the 2015 state final between Rainier Beach and Garfield takes place tomorrow at 5:30! Rainier Beach 81, Lincoln 63. The 2pm boys quarterfinal comprised Metro League foes in defending champs Garfield and upstart Cleveland. The high-flying Bulldogs led early with contributions by defensive specialist Terrell Brown and pure scorer Jaylen Nowell. However, CJ Elleby would not let the Eagles go down without a fight and knocked down bucket after bucket to keep Cleveland within striking distance. The tremendous balance of the Bulldogs proved too much in the end with five double-figure scorers with Brown and Nowell tied at 16 apiece. Cleveland’s Fahad Sharif joined Elleby’s charge down the stretch with a combined 41 points in the contest forcing Garfield to keep their starters in for nearly the entire second half. Garfield never put their lead in jeopardy and punched their ticket to face Rainier Beach in a marquee game tomorrow night. A championship caliber game in the opening round of the state tournament pitted a pair of undefeated Eastern Washington powerhouses in Moses Lake and Central Valley. Lexie Hull established her presence in the first half netting 12 points and 9 rebounds in the opening two quarters. Moses Lake used a balanced attack including sharpshooter Jamie Loera and Abby Rathbun in the post to earn a one point lead at the break. The Chiefs showed defensive intensity that carried them early in the third quarter that provided them an early boost of momentum including a grand total of 14 and 12 for Loera and Rathbun respectively. However, Central Valley made their move in crunch time as Hailey Christopher and Hull combined for 30 total points and put Moses Lake in a must-foul situation in the final minutes in which the Bears capitalized at the stripe. Central Valley 47, Moses Lake 39.